Last month our posts on the US M73 and M85 tank machine guns proved rather popular. We figured people might enjoy this article from an old 1976 issue of International Defense Review on US tests to find a new coax machine gun in the 1970’s. The tests compared two weapons, the M60E2 and the MAG 58. The MAG 58 would win the competition and enter US service under the designation M240. Here are a series of videos by World of Tanks documenting the history of tanks by country. The content seems reasonably accurate. The computer graphics seem to be taken directly from the game (unfortunately.) These videos are not new, but we figured they were good enough for a slow news day. Back in July we posted on the Israeli Pereh missile tank. That post garnered more views than any other post we have done. As a follow up, here is a video and some images of the Pereh in action. Unfortunately, there is no English translation available for the video, but the images alone should prove quite interesting for those that are curious about his rather unusual vehicle. Much ink has been spilled over the past 70 years on the Normandy Campaign of 1944 and about the tanks used in that campaign. Author Stephen Napier decided to put his own mark on the discussion with his new book ” The Armored Campaign in Normandy.” At over 400 pages of text, this is an impressive work, well documented and footnoted. Napier’s central thesis is that the performance of British Armored forces in Normandy was rather lackluster and often failed in the face of resistance from German forces, even when significantly outnumbering their opponents. He lays the blame for this on a variety of factors, including General Montgomery, British divisional and regimental commanders, British tank doctrine and technical deficiencies of British tanks. His analysis of the German commanders is even more harsh, noting the convoluted chain of command of the German forces in Normandy which was almost guaranteed to create indecision, confusion and defeat. The next chapter is on the only one not focused on a particular battle, but rather describes the tanks and tactics used by the combatants of the Normandy Campaign. Napier describes the armor and firepower deficiencies of the M4 Sherman and British Cromwell compared to some of their heavier German tank adversaries. He also describes some of the daily realities that tankers faced in the Normandy Campaign, their lives spent maintaining and living inside a cramped metal box on treads. The rest of the book is broken down into ten more chapters, each looking at a major operation. Since most of these operations, such as Epson, Goodwood, Totalize, or Tractable, were initiated by UK forces, the focus of much of the book is on British armored units. Napier’s descriptions of these battles is lively and he presents a good deal of detail. Intermixed with his descriptions of the battles are quotes taken from participants of the action, both Allied and German. These quotes add considerably to the book, helping to keep the readers interest and provide some color. One nice touch is that Napier usually follows up these quotes with relevant information from the historical record. This is quite useful in regards to the quotes from some of the German tank commanders who often make claim to killing a certain number of tanks. Napier sometimes follows these quotes with unit loss figures from Allied sources, often showing that the German tankers exaggerated their kill counts by a factor of 2 or 3. In popular accounts of the Normandy Campaign, much is often made about the technical disparities between Allied armor and the dreaded German Tiger and Panther tanks. Napier addresses this issue, but keeps it within its proper context. He notes that while this was factor, it was certainly not the only factor in explaining the sometimes poor performance of British Armor versus their German adversary. If anything, the reader comes away with the impression that by 1944, the tank had lost the aura of invincibility that it had in the 1939-1941 era and that any attack by armor against a position well defended by tanks and anti-tank guns was bound to suffer heavy casualties. This is illustrated not just by the attacks carried out by British units, but also by the counterattacks attempted by the German Panzer forces. Despite whatever technical advantages the Panzer forces might have had, when used on the offensive in the Normandy Campaign, they almost always failed to achieve their goals. This is well illustrated in the chapter on the ill-fated German Mortain counter-attack. The book comes with a center section of black and white photographs. While interesting, these pages would have been better used to include a more detailed series of maps. The few maps included in the book are frankly a bit inadequate considering the number of battles described in the text. That said, the book itself is well made and the paper quality good. Personally, we feel that a picture of a British tank would have been more appropriate than the Tiger tank which adorns the front duct jacket, but we realize that nothing sells a tank book quite like the image of a Tiger tank. 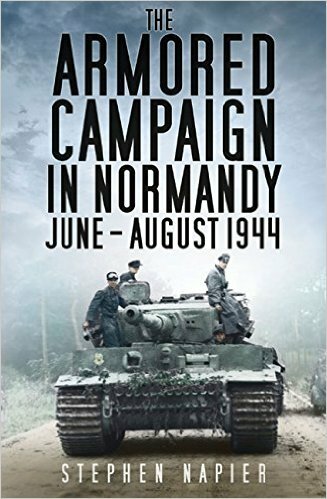 That said, we highly recommend this book for those looking for an account of armor in the Normandy Campaign. Special thanks to Casemate publishing for providing a review copy. Modern Mechanix.com is a great website that hosts hundreds of old magazine articles and ads about technology. We combed through the site to find as many posts as we could relating to tanks or armored vehicles. Below is a list of what we found. Many of these articles are rather amusing since the technology presented is either fantastical or just plain impractical. Not much of use for the serious researcher, but it should provide some entertainment for tank and AFV fans. A couple weeks ago we posted links to a Russian language series of videos created by World of Tanks examining different factors in tank design. I appears that World of Tanks Europe has released a similar English language version of the series as well. These videos are pretty basic in terms of the information presented, but people may enjoy the footage presented. A video featuring Jane’s 360 reporter Chirstopher Foss at the recent DSEI 2015 exhibition explaining the new UK Scout SV vehicle which has been renamed Ajax.